Judging from the people around me and popular opinion on Twitter, I seem to be one of the few people who actually look forward to January. I really enjoy the promise of a fresh start. Now is the time to learn from what you've experienced over the past twelve months and to set goals for the year ahead. I'm taking inspiration from last year's resolutions as they seem to have worked well. Hopefully this year, I can achieve them to a higher level. This is something I work on all the time because it's something that I feel is really important and it's now a continuation of previous year's efforts. I hardly drink anything else other than water and cook most meals from scratch now. I want to increase how much water I'm drinking; it helps enormously with making my hair and skin feel healthier and does wonders for making me feel more awake! I also aim to be more creative with the food I cook. Hopefully, I'll get some recipes up on here! Last year I decided to tackle this one by starting Brighton Girl. It was probably one of the best decisions I've made. 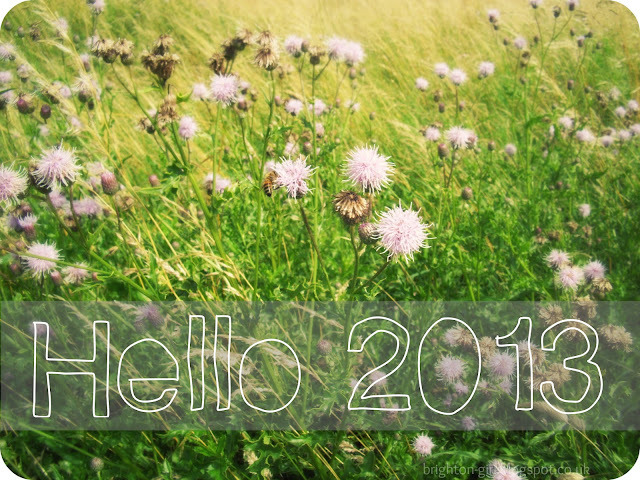 This year I hope to continue to blog regularly and to start to experiment with some creative writing projects. Keep a record of things that inspire me. I took art at A Level and it was my favourite subject throughout secondary school. When it came to choosing a degree, I really couldn't decide between English Literature or Fine Art. Three years and three UCAS applications later saw me accept a place at Sussex to read English. My paints and pencils were packed up and put under my bed. When people ask me now if I still paint or draw, I tell them I don't really have the time. The truth is that I don't have the confidence. I'm scared that I won't like what I've created. So the paper, paints and pencils have stayed under my bed and are now adorned with a thick layer of dust. This year, I WILL get them out! Writing up this last point has made me realise that there's a phrase I need to apply to every opportunity or thing that I want to do, but am maybe too scared to because of my own lack of self confidence. I've put off doing something, that made me happiest, for four years, purely because I didn't think I'd be good enough. Like most people, I need to stop worrying about not being 100% perfect at everything and "Just do it!". These are my goals for a happy and creative 2013. What are yours? Btw, great blog! found you on She Said Beauty!